Complete with original warranty with retailer stamp, hangtag and red box. 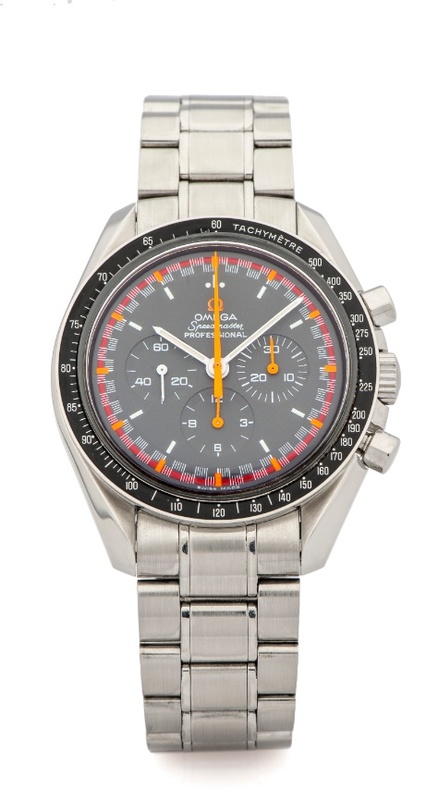 NOTES: Confirmed with Omega to be an authentic 3570.40 delivered to Japan in 2004. In 2004, Omega produced a limited number of 2004 Speedmaster Professional (ref. 3570.40.00) watches with a racing dial only for the Japanese market. Previously the Speedmaster had been released with a racing dial in the late sixties and early seventies. This dial also resembles the Speedmaster Mark II racing dial from 1969 in grey and orange as well.